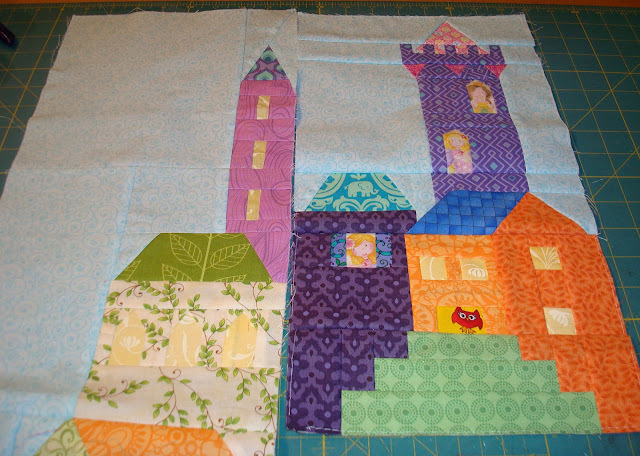 Time marches on so quickly...Ula Lenz has the July castle block available and I am really looking forward to getting it done and added to the castles. Before I can do that I need to share what the June addition to the castle properties has brought to the gnomes and princesses. The gnomes have some lovely new roofs emphasizing LOVE. 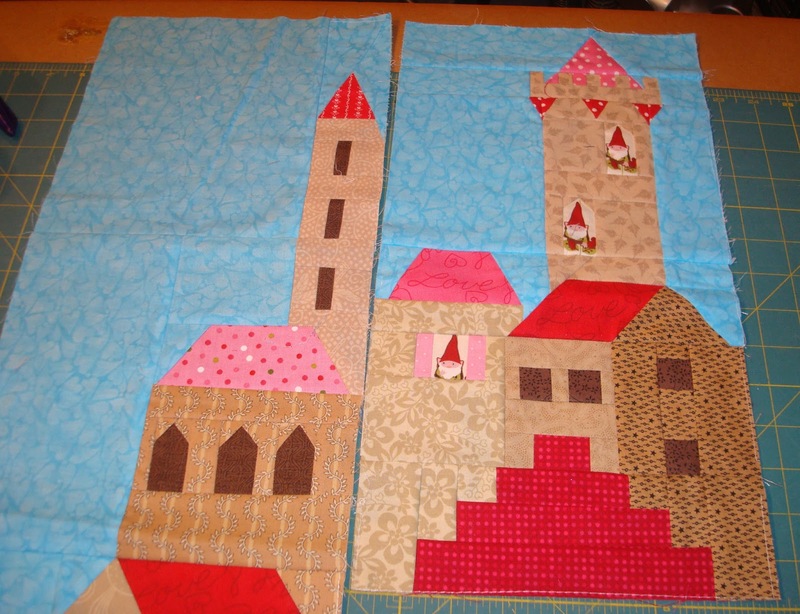 What appears to be red stairs is actually going to be a rooftop on a July castle building. The princesses new block has a little deviance from this one. When I started putting it together I forgot that the top of the roof was the roof and instead made it into a window for the orange building instead. I was so excited to pick out a little owl to live there that I messed up the roof. Oh well the grand-daughters will as excited to see an owl living there as I was!!! I started this one with pastels in mind but I kind of like what the darker colors do to jazz up the castle. It was looking a little to washed out for my liking. I also got July off to a quick start with my Craftsy block. 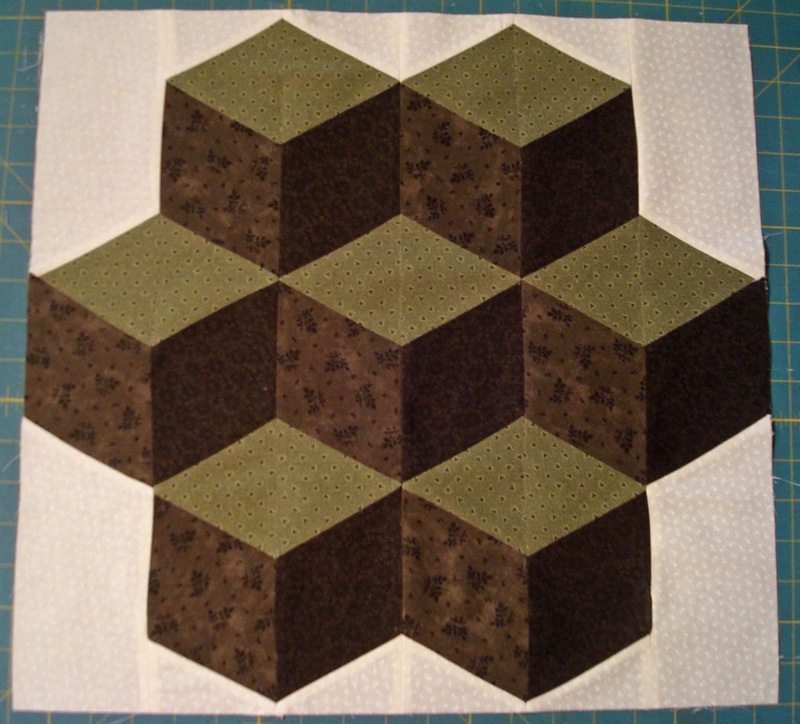 This month Laura had us making a Tumbling block which was another first for me. 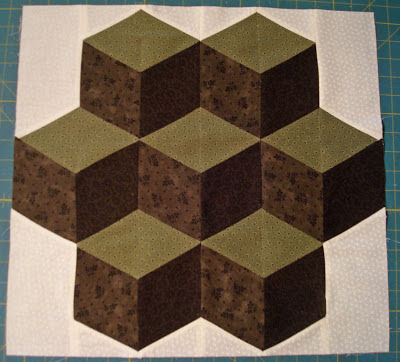 One of the things that was a pleasant surprise to me was that she eliminated the Y seams by having us put it together in vertical rows by splitting one of the diamond shapes by replacing it with two triangles instead. Laura warned us that one of the hardest things would be picking out three distinct values to make the light, medium and dark values. I messed around with fabrics for a while and really wanted to use fabrics from my current stash as I am trying to use some fabrics I've had around for years and feel like it is time to use them in a project. 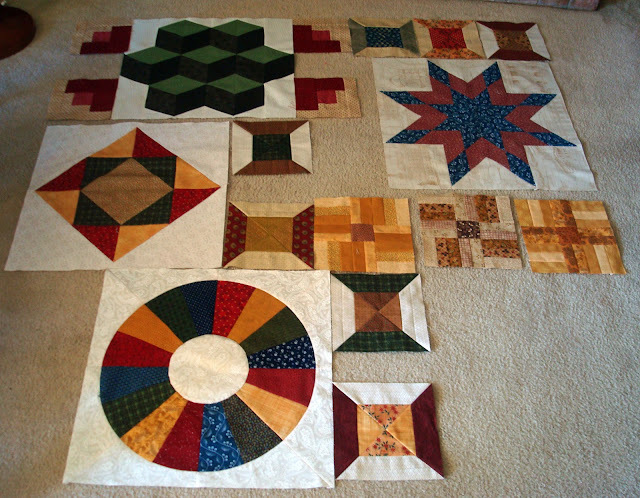 I think I could have done better with the blues in my stash but chose green just to add something different from the other colors that are predominant in the quilt top so far. My dark and medium values are too close to each other to read as distinctly different from a distance even though up close they appear to be different shades. They probably needed to be at least three shades lighter than each other. Oh well, lessoned learned but I can live with it. I laid them out in the general placement they will be in . I will have to say this is one crazy layout with all the different sized blocks. When I trimmed this one to size I decided I had better trim last months block down, too. Problem is it ended up a 1/4 inch bigger all around then it suppose to be because I refuse to cut it to her size and lose my perfect points on the Lemoyne Star. I think when I put it into the quilt I will be able to reduce the border that Laura must be having us put around it and no one will know but me and you and I'm not going to tell and I am sure you won't be turning me into the quilt police either, right?? ?